Fata Morgana at Efteling in the Netherlands. An old mill is a type of amusement park ride with unaccompanied boats floated on guideways through dark tunnels. These themed dark rides originated in the late 19th century and are known by a variety of names, including tunnel of love and river cave. While generally considered a gentle ride, a variation that ends with a climactic splashdown, similar to the modern-day log flume, is known as a mill chute. In its earliest incarnations, riders were taken by two-passenger boats through dark passages. There were two major themes: a relaxing romantic ride encouraging the couple to cuddle, or a spooky horror ride encouraging the couple to cling to one another. The darkness provided a degree of privacy and the frightening scenes offered a socially acceptable excuse for the physical contact at a time when public affection or even holding hands was considered inappropriate. With the development of other socially acceptable opportunities and less stigma for unmarried couples to engage in physical contact, these rides became less popular and were either re-themed into children's attractions or torn down completely. 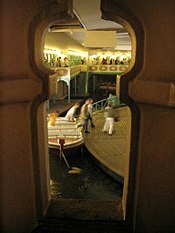 Riders travel slowly on themed boats along an artificial river that meanders through decorated caves and tunnels featuring different themed scenes of lighting, sounds, props, animatronics, or other visual effects. The boats drift along on a gentle current, typically generated by a paddle wheel. This type of amusement ride became relatively common at amusement parks across the UK and the USA in the mid-20th century. The concept of the river cave is also very similar to those of the early scenic railways in that they attempt to be both educational and entertaining. Once a popular feature of many amusement parks, river caves are now relatively rare and can be found in only a few locations, mainly in the UK and United States. Despite their popularity in the early to mid-20th century, the shift in focus to the thrill ride in the latter half of the 20th century onwards and the sheer age of the design and mechanics of these rides means that many have been dismantled and sold or destroyed altogether. The ride's name stems from the fact that most were themed around subterranean caverns, with styrofoam stalagmites and stalactites housing detailed displays from around the world, through time and from myth and legend. A "mill chute" is a variation of the old mill, featuring roller coaster-like drops at the end, in which riders get soaked. The major difference between the old mill and the mill chute is that the mill chute contains a drop at the end. Mill chutes have the same-styled grottos and caverns as old mills. Mill chutes were mainly manufactured in the 1920s and 1930s, while old mills were mainly manufactured in the late 19th century through the 1930s. Though old mills have drops, they are not as steep as the last drop on a mill chute (hence the name "chute"). The last drop on a mill chute ride is typically steeper than its first drop: though it is typical on roller coasters to have the steepest first drop, water rides have fiercer endings. The mill chute is considered the predecessor to the modern-day log flume. ^ The park was closed in 1902 and later reopened as Luna Park, with renamed and rethemed attractions. ^ Known as the world's oldest operating old mill attraction, the ride has been renamed and rethemed several times, to "Around-the-World" in 1954, "Hard-Headed Harrold's Horrendously Humorous Haunted Hideaway" in 1974, and "Garfield's Nightmare" in 2004. ^ Originally called "Around the World in Eighty Days" and depicting scenes from countries around the world, the ride was rethemed as a toy factory in 1994 and renamed "Toyland Tours". It was later rethemed again as "Charlie and the Chocolate Factory: The Ride". ^ Originally located at the first Pleasure park in Southport, it was moved to Pleasureland in 1922. ^ Opened by John Keenan in 1915, Ye Old Mill is the fair's oldest attraction. The fair purchased the attraction for $80,000 from the Keenan family in 2018. ^ Themed "Journey to the Center of the Earth" in 1960 by dark ride designer Bill Tracy, the ride featured illuminated scenes of trolls, giant spiders, snakes, and miners. ^ Originally designed by renowned coaster designer Herbert Schmeck, the ride was rethemed in 1964 to the "Lost River" by Bill Tracy. The attraction was destroyed in 1972's Hurricane Agnes. ^ Originally located at 1964 New York World's Fair, the ride was disassembled and shipped to Disneyland where it reopened in 1966. Similar installations were later built at other Walt Disney theme parks around the world. ^ The attraction was the last with construction oversight by Walt Disney at Disneyland. Similar installations were later built at other Walt Disney theme parks around the world. ^ Was a part of Nallin-Jennings half of Park in Moosic, Pennsylvania. Sometimes spelled as "Tokio"; Name changed to "Glen Canal" some time after World War II; Was built underneath the Pippin Coaster (1924-1950). The ride was destroyed May 24 1950 after a massive fire also took the Pippin, the Fun House, and Ben Sterling’s Penny Arcade (who owned the other half of the park). In the 1928 film The Crowd, a tunnel of love is featured in which the sides are voyeuristically pulled down at a place where couples are likely to be kissing. The 1951 Alfred Hitchcock film Strangers on a Train features a tunnel of love ride that becomes the scene of a murder. The tunnel of love was a favorite source of amusing scenes in Hanna-Barbera television series such as The Flintstones, The Jetsons, and Scooby-Doo, among others, often in a chase sequence gag in which rivals or combatants are shown entering the ride, then exiting in a romantic embrace. The tunnel of love has also been used in Disney cartoons, mainly a jealous Donald Duck storming the tunnel by foot and ruining the ride for a rival suitor and Daisy Duck. In 1980, Dire Straits released a single entitled "Tunnel of Love" from their album Making Movies. Bruce Springsteen recorded an album called Tunnel of Love in 1987 and a song of the same name. A 1990 episode of the TV series 21 Jump Street was called "Tunnel of Love". A tunnel of love is seen in a 1996 episode of Hey Arnold! called Operation Ruthless. A tunnel of love is also seen in a 2008 episode of The Simpsons called Love, Springfieldian Style and in a 2010 episode of the show American Dad! called "May the Best Stan Win". In the graphic novel The Dark Knight Returns, an alternative future story published in 1986 that features the Batman, super-villain Joker fights with Batman in a tunnel of love and manages, after putting the superhero into a fit of rage, to frame Batman for murder of the Joker. Wikimedia Commons has media related to Old Mill (ride). ^ Hoffman, Laura J. (2014). Coney Island. Arcadia Publishing. p. 46. ^ Magan, Christopher (September 1, 2012). "State Fair's Ye Old Mill: As timeless as a first kiss". St. Paul Pioneer Press. Retrieved July 15, 2015. ^ "Operating Classic Amusement Park Rides". ^ Smith, Ellis (October 25, 2012). "Lake Winnepesaukah to invest millions in 5-acre attraction". Chattanooga Times Free Press. Retrieved August 6, 2014. ^ "Tunnel Of Love: brucespringsteen.net". Bruce Springsteen. Retrieved 2010-05-18. This page was last edited on 23 June 2018, at 08:37 (UTC).